When they were young, Matthew and Mitchell McCranie made it clear to their dad, Mike, that farming wasn’t for them. Instead of making plans to return to the Claremont farm that has been in their family for more than a century, they pursued engineering degrees at South Dakota State University. Life experience has a way of changing minds … Today, both engineers are farming with Mike and his wife, Monica, raising soybeans and corn. And, it’s for his sons, and the sons and daughters of soybean growers across South Dakota, that Mike left 2018 harvest prep to Monica, Matthew and Mitchell this fall and participated in a trade mission to India, representing the South Dakota Soybean Research & Promotion Council (SDSRPC). SDSRPC is South Dakota’s soybean checkoff organization and focuses on increasing opportunities for South Dakota soybean farmers by wisely investing checkoff dollars in marketing, research, education and promotional initiatives. 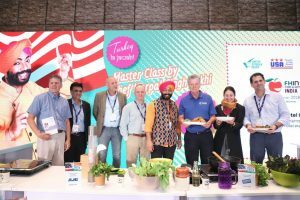 The trade mission to India was organized by the USA Poultry & Egg Export Council and designed to build relationships to bolster exports of U.S. poultry. And, because U.S. poultry is the largest consumer of U.S. soybean meal, McCranie says increased poultry exports will in-turn increase state-side demand for soybean meal. Mike McCranie (third from right) is a Claremont soybean farmer and Secretary of the South Dakota Soybean Research & Promotion Council (SDSRPC). In March 2018, India officially opened trade to U.S. poultry and eggs. Mid-April, India ports saw the first shipment of U.S. chicken leg quarters. At the time of the trade mission, the U.S. was the only country India had opened its poultry markets to. Since early 1990s, McCranie has served multiple terms on the SDSRPC board as well as the United Soybean Board where he served as vice chair of the international marketing committee when checkoff dollars sponsored some of the first trade missions to China. He compares today’s India export potential to what soybean farmers saw in China at that time. “Just like China 30 years ago, India’s middle class is growing, and with that, their ability to add more protein to their diet,” McCranie explains. “With poultry, we have a large advantage over any other meat sector because it is a meat that is accepted by all religious groups in India,” he says. Based on reports from India’s health organization, many of their citizens are protein deficient. With per capita consumption of protein under 8 pounds a year, the health organization urges its population to nearly double their protein intake. Trade issues with China were not reality when this trade mission to India was planned, however they were well underway when the USA Poultry & Egg Export Council team began working to build export relationships in India. During the trade mission, McCranie and members of the USA Poultry & Egg Export Council met with 150 poultry producers, importers, retailers and governmental representatives during a reception at the home of U.S. Ambassador to India. They held meetings with importers in New Delhi and Mumbai, networked with members of the Forum of Indian Food Importers and the Federation of Cold Storage Association and visited poultry processing facilities and cold storage units. McCranie gave a talk on the U.S. soybean farmers supporting increased exports of U.S. poultry to India and how and why we want the cooperation of all involved. “When you have that one-on-one relationship with potential buyers or buyers you have established, it builds trust. It also builds the confidence that this market will be here. It’s not like you’re going to make a sale and leave,” McCranie says. He sees this trade mission as just the beginning. This blog post is brought to you by the South Dakota Soybean Research & Promotion Council.